As we walked over to the cow pens, a cute goat stuck his nose through the fence and gave us a smile! 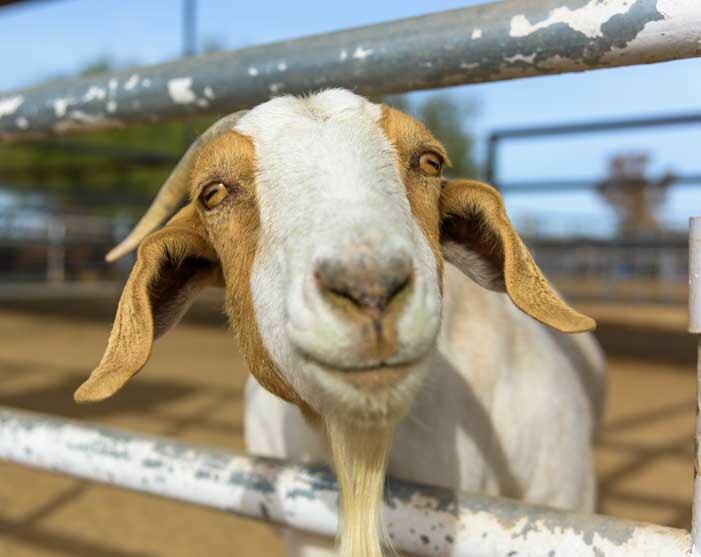 A goat welcomes us to the ranch sorting competition. There were about twenty competitors, both cowboys and cowgirls, sitting astride their horses and waiting for the games to begin. In the competition they paired up in teams of two in round robin fashion so every rider had a chance to team up with the others. Riders line up before the competition begins. There were several pens of ten calves each, and as the competition progressed, each group of calves had a few chances to get sorted. Every calf had a big number on his back, from one to ten. The calves all turned to look at me when I stuck my camera lens between the bars of the pen to get their portrait! Calves wait to be sorted. Each calf has a big number on its back so they’re easy to spot and isolate from the herd. 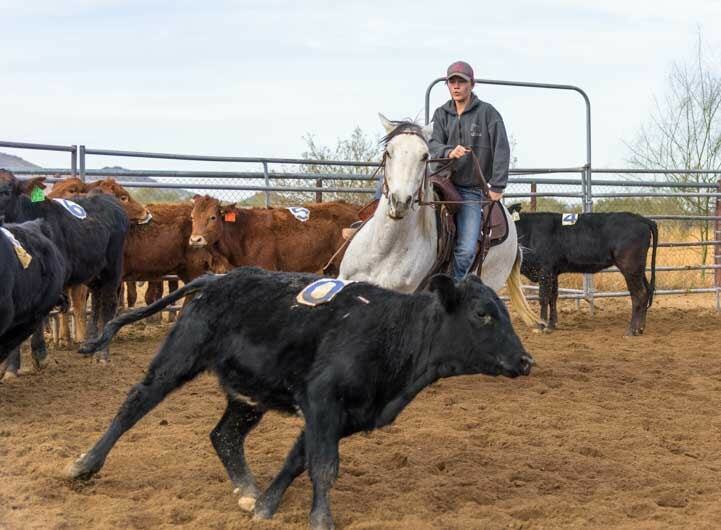 Ranch sorting mimics the process that cowboys use to separate a single calf or cow from the herd so they can inspect it or administer medication or isolate it for some other reason. 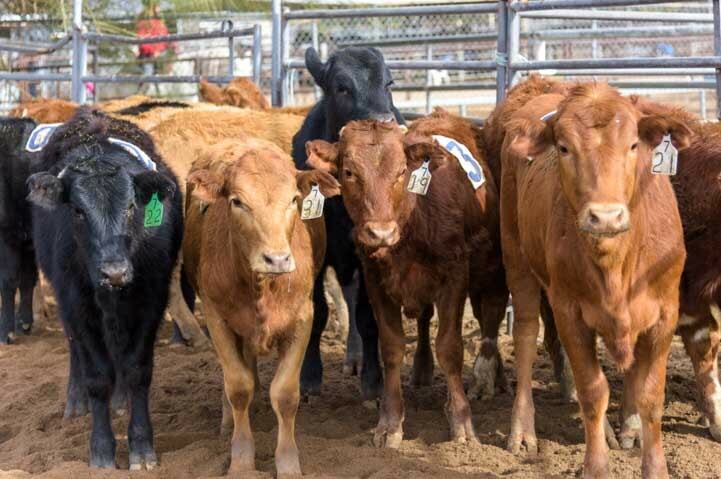 In the cattle sorting competition, a pair of cowboys / cowgirls enters the pen with the calves and waits to hear the number of the first calf they’re assigned to isolate. For the next sixty seconds they chase after the calves in numerical order, starting with the first number they were given and then isolating each successive calf and sending it into an adjoining pen. Our young friend Autumn rides into the herd in search of her target calf. 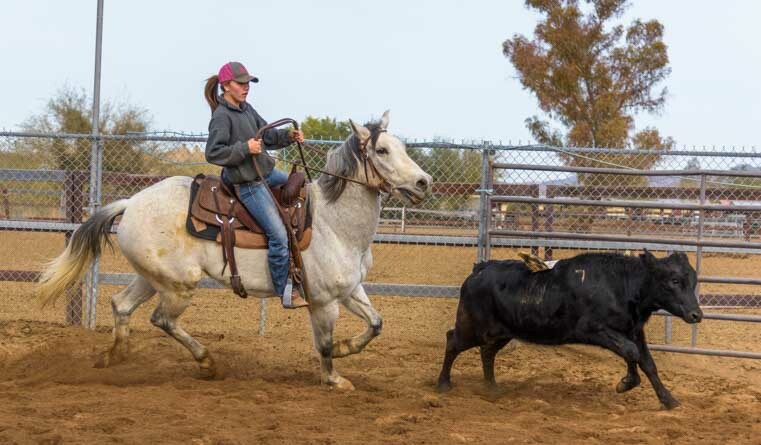 Ranch sorting is a fun way for riders to hone their horsemanship skills. Working together, one cowboy (or cowgirl) chases the target calf towards the gate to force it into the adjoining pen while the other cowboy or girl blocks the rest of the calves from running into the pen along with it. We really enjoyed watching the action. The riders skillfully maneuvered their horses among the calves to find the one they were after and then chased it into the pen next door. 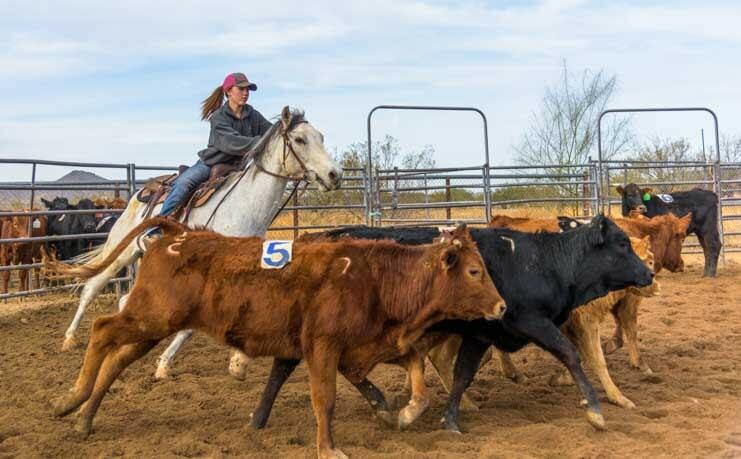 Getting the horse and calves to do what you want looks easy from the sidelines but takes a lot of focus and knowledge. 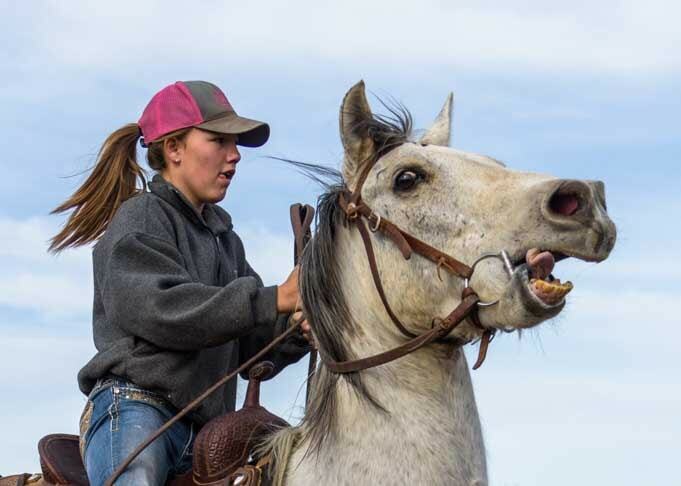 The rider’s body position in the saddle and the way they hold the reins and touch the horse with their feet is the language they use to tell the horse what to do. 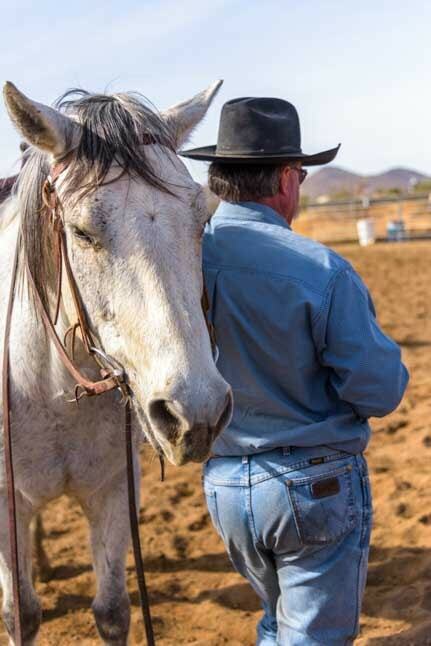 A wrong hand position or posture in the saddle can give the wrong command to the horse! Autumn concentrates and the horse sticks his tongue out too! The cowboys and cowgirls were scored based on how many calves they managed to get into the adjoining pen in the 60 second time period. If a calf sneaked into the pen out of numerical order, then the score for that round was 0! The distance between the pens is short. Once the calf is isolated, it’s a quick sprint from one to the other. The biggest challenge in each round was the first calf because cows are herd animals and they don’t like to be alone. When the first calf found itself isolated from the herd and being chased towards the empty pen next door, it would try to return to the herd rather than go into the empty pen by itself. However, once a calf or two was in the adjoining pen, the next calves were a lot less reluctant to go in there because they saw there was company waiting for them. On rare occasions two sequentially numbered calves would be running alongside each other and would go into the pen one right after the other. A two-for-one! Sometimes the rider got lucky and a pair of cows with sequential numbers went through the gate together. 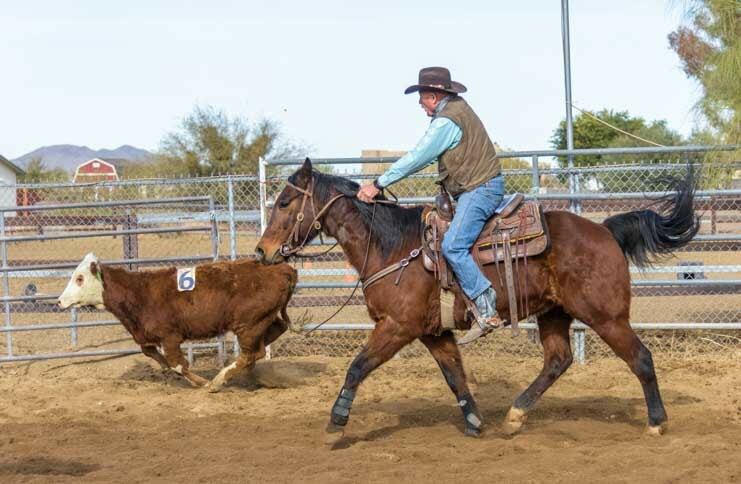 The cowboy life, horses, barns and hay aren’t in my blood the same way sea breezes and hiking trails in nature are, but we had a wonderful time watching this classic western event. 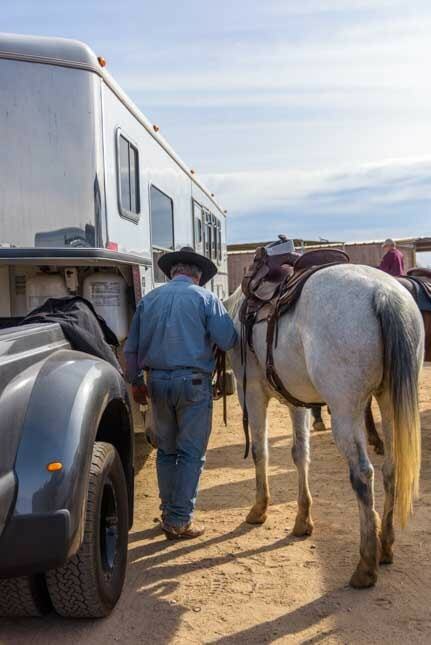 Cowboy culture is rich and widely celebrated across the western states. We have loved learning about it in our travels. 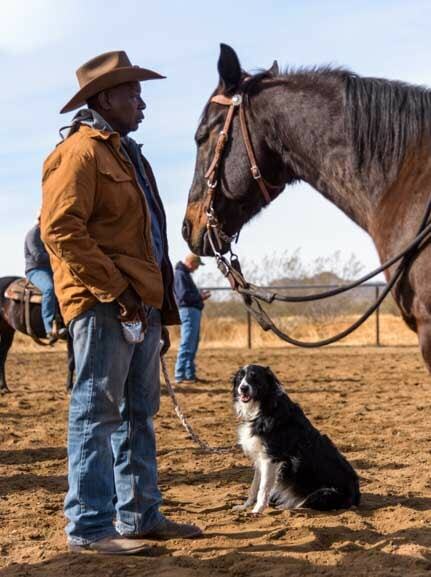 Of course, not everyone at the ranch sorting competition was quite as enthralled as we were. 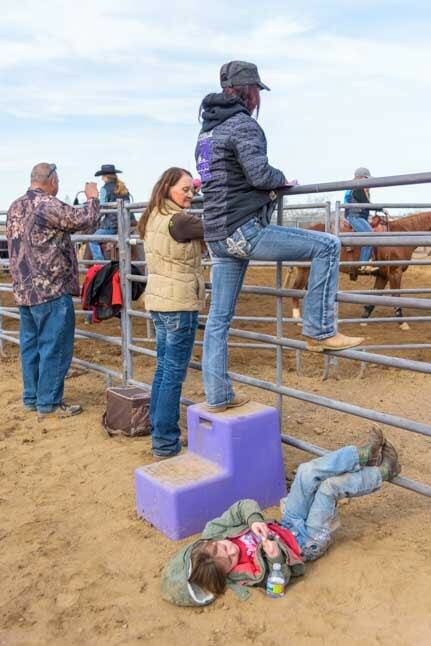 One little cowgirl was so tuckered out by the action that she suddenly dropped into the dirt next to the referee (her mom) to relax with her feet up on the fence. 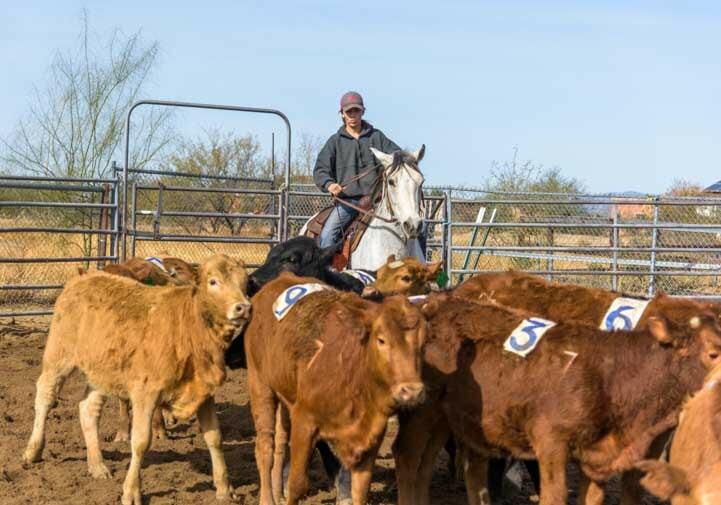 When we researched the sport of ranch sorting after the event was over, we learned that these cattle sorting competitions are fairly new to the ranching scene and the first Nationals was held in 2007. But they are becoming extremely popular. A friend of ours suggested that knowing tackle angles from football would be helpful with anticipating which direction a calf will run. 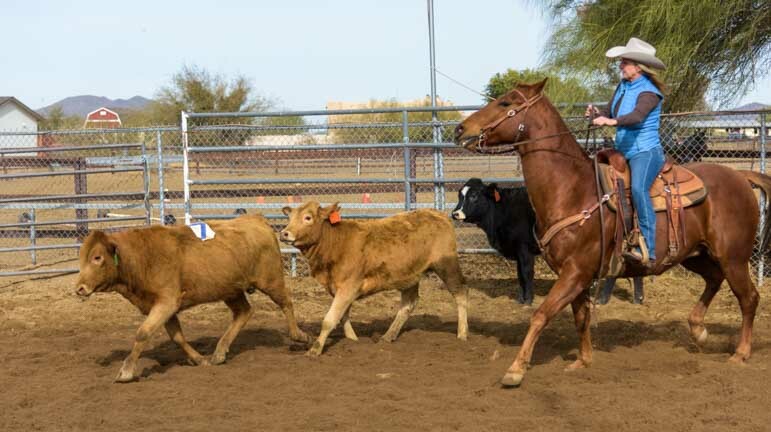 The folks that were at this particular ranch sorting competition were extremely enthusiastic, and they attend events all over Arizona. Calf #3 says, “I’m outta here!” while #2 heads through the gate. The riders told us #8 was particularly feisty! For us there were lots of neat photo ops and we got a kick out of roaming among the spectators, spouses, parents and loyal dogs. Spectators were treated to a fun event. What do the animals think of all this? The horses seemed to love it and the calves got some good exercise and worked up an appetite for grazing later. 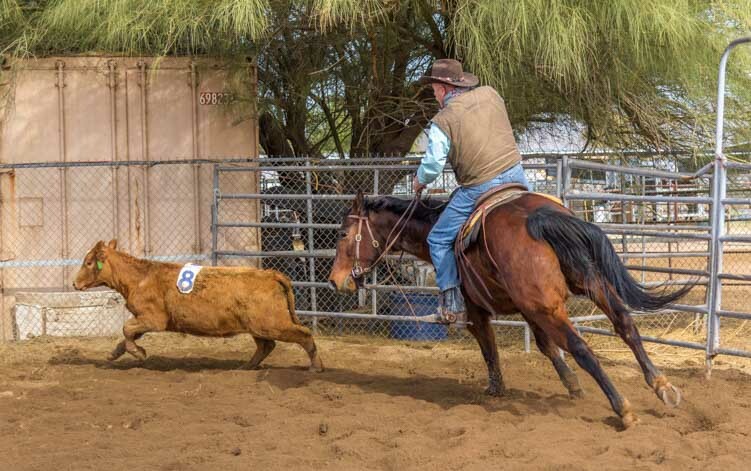 Unlike the big rodeo events like roping, ranch sorting is something newer riders can enjoy. 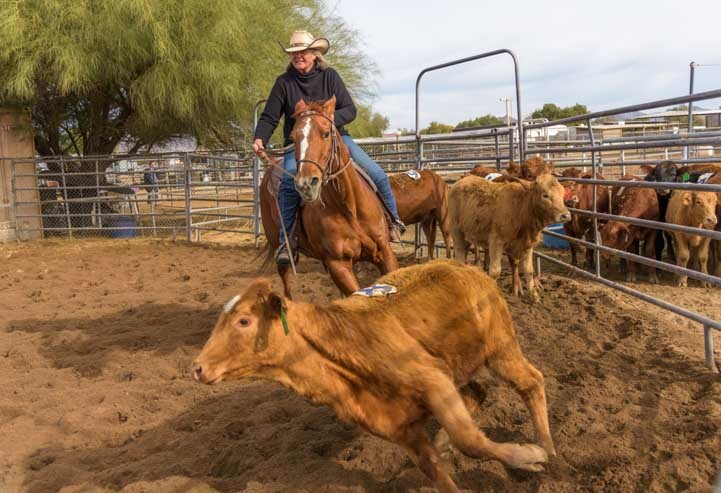 For us watching, it was easy to understand what was going on and to root for the cowboys and cowgirls as they whooped and hollered and worked to make both their horses and the calves do what they wanted. 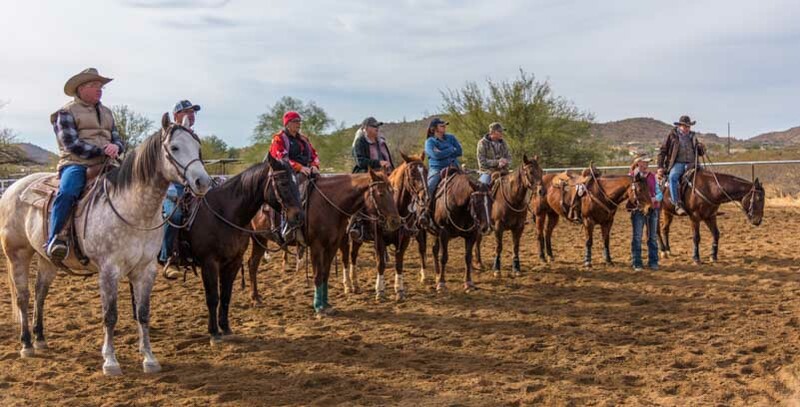 If you are spending the winter in Arizona and want to experience a brief immersion in some of the western traditions of horses and cowboys, look for a ranch sorting competition! We’d never heard of this kind of event until last week, but we got a huge kick out of it! What a fun few hours spent in the midst of cowboy culture! 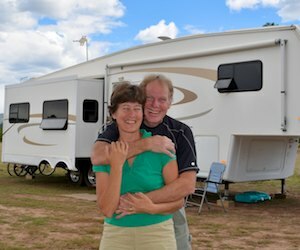 Central Arizona RV travel article index and more from our trips in the whole state of Arizona. 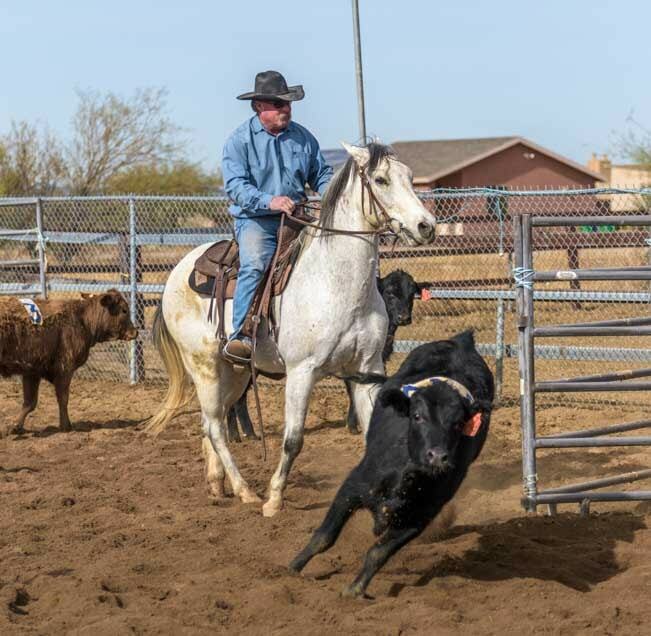 This entry was posted in Arizona and tagged Arizona, Arizona Central, Cowboy Culture, New, Special Events, Travel, USA, WP Travel by Roads Less Traveled. Bookmark the permalink. A little different road for you, but I love it! Cool! 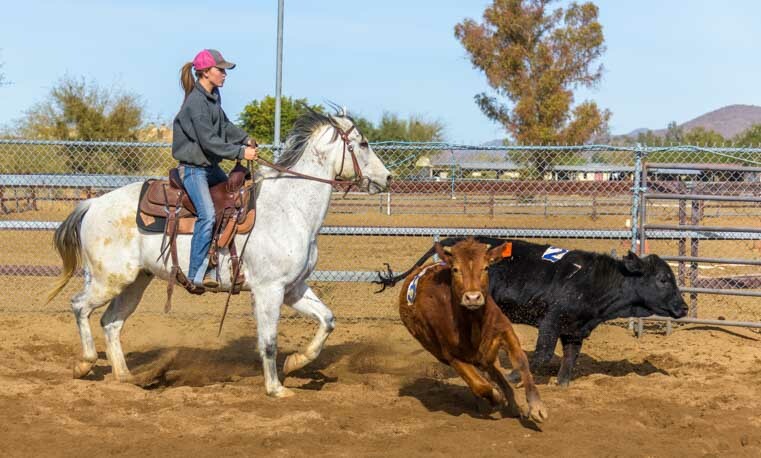 Maybe “Team Penning” is a more correct term, or perhaps there is a subtle difference in the rules between the two since the Nationals refer to it as “Ranch Sorting.” Either way, it’s definitely a very fun event! looks like a lot of fun, even if you don’t win….IF you have good riding skills! Those riding skills are definitely key to having a good time… When I’m in the saddle I’m lucky to get a horse to walk forward slowly and not try to brush me off by walking under low hanging branches!! 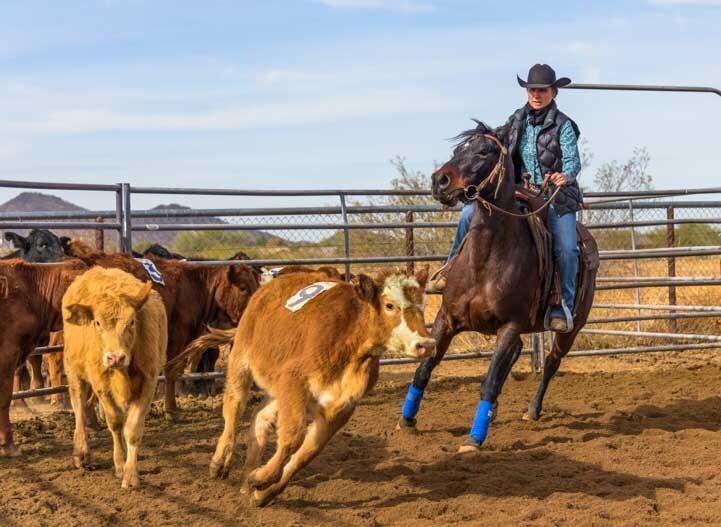 …from Boston, “Ranch Sorting” looks exotic and exciting, requiring riding skills and practice – just to keep in the saddle ! It’s a whole different world, and lots of fun too!! Maybe I can shed some light or share more information. Fun pictures BTW, as it is a sport that is very difficult to capture great pictures because the action is so fast. But …. 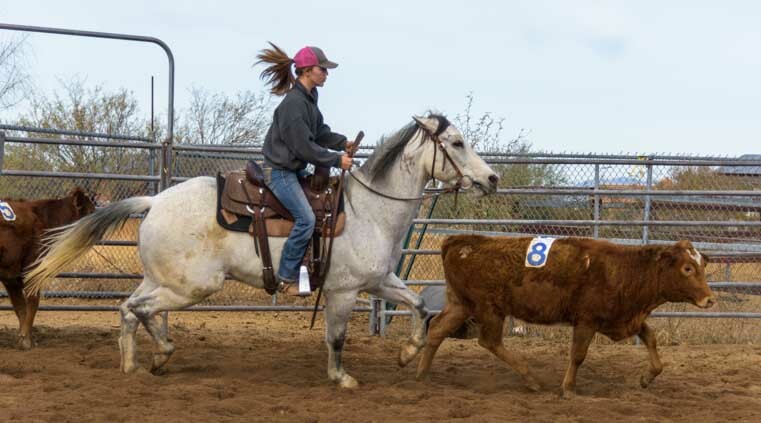 There are both Team Penning AND Ranch Sorting events. 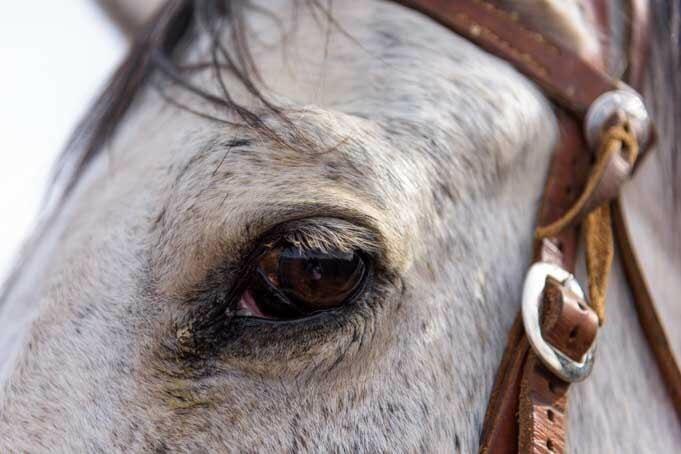 Team Penning is a result of a team of 3 being given a certain drawn number. The team then has to find all 3 cattle with that number and gather them into a pen. Ranch Sorting is a little different. A team of 3 is also given a certain number and then the team has to find that number first and then in sequential pattern, gather the rest into a given pen. If any other number happens to go into the pen out of sequence, the team is disqualified. Its a bit more complicated, but exciting just the same. There are rules for the Team Penner’s as well, which make both of the quite challenging. I couldn’t say for positive, but I believe the Team Penning competition was started first and then the Ranch Sorting spun from that. I’ve followed Roads Less Traveled since 2016 and its nice to see they enjoy a wide variety of “American Dreams”. Their Photos are always like eye candy! Safe Travels and God Speed! Maybe our paths will cross someday…. We hope to also break free at some point in the next year. Thank you so much for clarifying this, Jo. We loved the action and it sure seems like a fun and challenging sport. One of the greatest thrills in this traveling lifestyle is being able to discover the many “American Dreams” that are out there. The drive and devotion these riders demonstrated that morning was impressive, and when we showed our photos to a few of them later, we were amazed to see them instantly start critiquing their form and riding style! All we had been paying attention to was the composition and photographic technical merit of each of our images! Thank you for following our blog and for appreciating our photos. Perhaps our paths will cross some time.